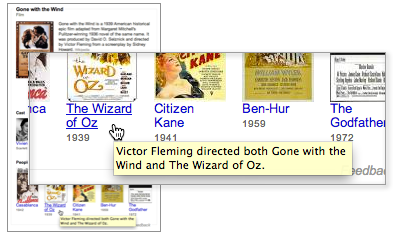 Inside Search: “People also search for” -- now with explanations! “People also search for” -- now with explanations! We’re starting by showing major co-starring roles between actors, movies, and TV shows as well as highlighting family connections amongst famous people in the Knowledge Graph. These connections won’t show up all the time, but when there is an interesting explanation available, you can now see it at a glance. Happy browsing!